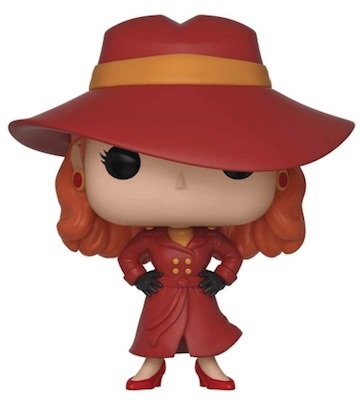 Product DetailsNo need to wonder where she is anymore as Funko Pop Carmen Sandiego delivers the mysterious thief with no work required. First seen in 1985's Where in the World Is Carmen Sandiego? educational computer game, the elusive Carmen is dressed in her familiar red attire, including a red fedora, trench coat and heels. Shop for Carmen Sandiego Pop Figures on Amazon. The GameStop-exclusive features a disappearing effect as Carmen makes her escape. Both figures fall under the Pop! Television line. Carmen has appeared in various TV series, such as game shows and animated shows. More recently, Netflix released a rebooted cartoon series and announced a live-action film. Both feature Gina Rodriguez in the title role as Carmen Sandiego. 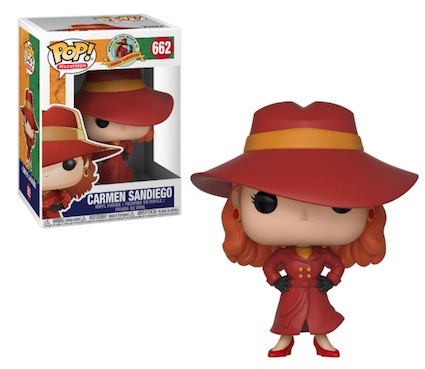 If you see any other Funko Pop Carmen Sandiego figures, let us know in the comments. Shop for specific figures on eBay or Amazon using the links below. Funko Pop - CARMEN SANDIEGO #662 Diamond Limited ECCC 2019 - NEW VIEW PICS!